Coverage of Division I, II, III Men's and Women's Basketball. As I was nearly home from work, I got a text while driving from my older son, Matt. "Can we go to the Alcorn-Crayton game? It's at Alcorn. 12 minutes away. And Bryson wants a ride if we are going." So instead of a Monday evening of putting up our Christmas trees and spending time decorating them, I'm taking two 13 year olds to a middle school in Columbia to see a basketball game. Yes, I have a teenage son. When I first started this blog, he wasn't even one years old yet. Alcorn and Crayton are two of several middle schools in Columbia, South Carolina. Matt and Bryson are both eighth graders at Crayton. Next year is high school for both of them. High School. It still hasn't sunk in yet for me. Google Maps sent me through a bunch of side streets to get to Alcorn. When we got there, we parked in the front lot. And soon as we walked up, we realized we had to go around to the back entrance. Once we got back in our cars and drove around, we saw the back parking lot. Full. We had to park on the side of road on the grass. Thankfully though I had two 13 year olds with me, they are still considered "kids" for admission purposes. Seven dollars later we walked into your classic middle school gymnasium with bleachers on both sides and well packed with families and cheerleaders for both teams. We sat right behind the scorer's table and watched both teams warm up. Even before there was a tap, you could tell immediately in warmups that Crayton had much more size and much more depth. Whereas Alcorn had nine, maybe ten players, Crayton had seemingly about fifteen. Crayton had a six foot four player on their team. A very athletic six foot four eighth grader who was their starting center. Thirteen years old. Geez. Matt and Bryson had both tried out for Crayton as seventh graders and didn't make the team. It worked out OK for them because both of the church teams they played on were pretty darn good last season. Both of them decided to not try out again this year for Crayton. That's OK. Their church team won their first game by twenty plus points, minus Matt and his friend Jack Painter, a very good guard (they had a baseball tourney in Georgetown). They'll be fine. 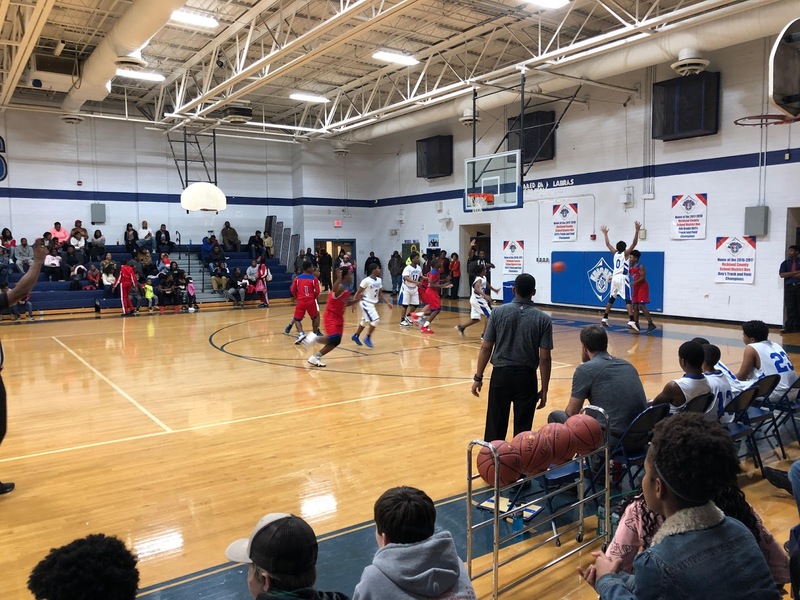 They just wanted to go and watch several of their friends on the Crayton team play. The Crayton team is coached by Bryson's social studies teacher. Wonder if he teaches the history of the half court trap in that class, because that's what Crayton came out on defense with immediately after the tap. And it worked. Crayton forced numerous turnovers right off the bat, creating a LOT of fast break opportunities. Within the first few minutes of the first quarter, it was 10-1 Crayton. And this was with the six foot four player getting two quick fouls and spending the rest of the first half on the bench. Both teams played very hard and very physical. If anyone tells you that basketball is a non contact sport, they have never played it. There were a lot of fouls called by the refs, who actually called a very good game, sans one non traveling call when a Crayton player did a Euro Step plus one in the second half. I so wish we had these two refs during all the years of watching Hofstra play in CAA conference games. What I also love at being at middle school gym was that it was loud. Both sides cheerleaders were cheering on their teams, the fans were engaged but respectful. And I couldn't hear what Matt was trying to tell me at times. That's the perfect environment for basketball. Crayton substituted freely and their second five are likely better than most starting middle school teams in Columbia. 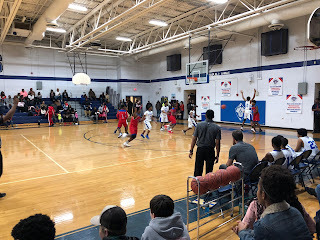 The starting running back on Crayton's undefeated championship middle school football team is also one of the starting guards on the Crayton basketball team. He ended the first half draining a running forty footer at the buzzer to give Crayton a 27-8 halftime lead. The second half was much like the first. Crayton forcing turnovers, dominating inside with their size and substituting freely. In the fourth quarter, the Crayton head coach literally made a hockey line change, taking out all five substitutes for his starting five. Alcorn would hit some long threes in the second half, but they were too little too late as Crayton won 56-18 ( I think that was the final score. I know Crayton had 56). We headed out to our car wondering whether Crayton's basketball team would follow Crayton's football team with an undefeated season. You never know. I'd still just like to ask Bryson's social studies teacher/Crayton's head coach if he talks about the history of the half court trap in class.